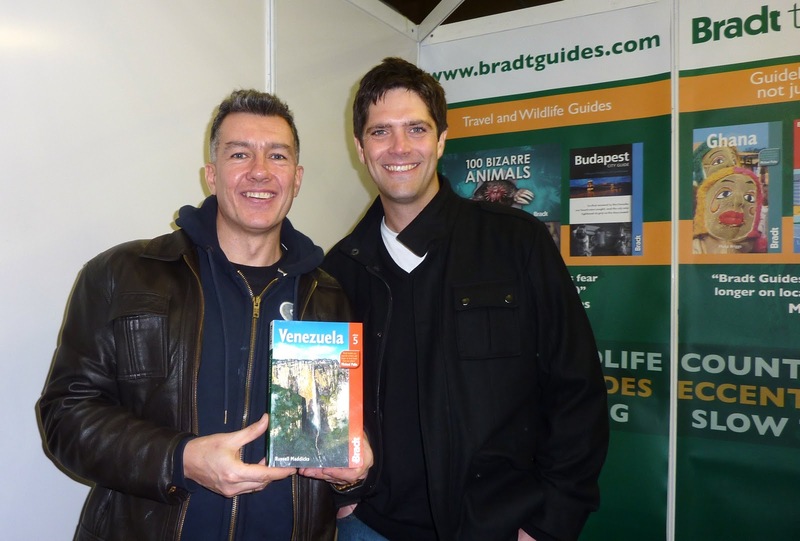 Showing off the new guide with Adrian Phillips, Bradt publishing director and guidebook author, at the Bradt book stall at the Adventure Travel Live show in London. This Sunday, 30 January, from 15:00 till 15:45, I'll be giving a talk about travelling in Venezuela at the Adventure Travel Live tourism fair at the Royal Horticultural Halls in Victoria London. The event brings together all the major adventure travel companies, guidebook publishers and specialist magazines for a three-day bonanza aimed at publicizing off-the-beaten track destinations, specialist wildlife destinations and once-in-a-lifetime travel experiences. This is a great opportunity for me to promote Venezuela as a travel destination, especially Los Llanos, Catatumbo, Angel Falls, Mount Roraima, Los Roques and cool places like Choroni. It's also the perfect venue to talk about my new book - The Bradt Guide to Venezuela. One of the 17 most megadiverse countries in the world, Venezuela, perched at the top of South America, is hot, tropical and home to Caribbean beaches, dense rainforests, high Andean valleys, mysterious table-top tepui mountains, and seasonally-flooded plains that are literally teeming with birds, beasts and creepy-crawlies. From the anacondas, capybaras and crocodiles of Los Llanos, to the jaguars, monkeys and tarantulas of the jungle, a well-planned trip to this fascinating country can reap rich rewards for wildlife watchers. In this talk, Russell Maddicks, who has been adventuring in Venezuela for more than 20 years, will highlight the main wildlife areas to visit and what you can expect to see. He will also give practical tips on how to minimize your impact on these fragile environments, travel responsibly, and give something back to the local communities you stay with. Adults: £6. Under 16s free.Order online at adventuretravellive.com or call 0871 230 7159 and quote “PV4”. Adults: £10. Under 16s free.